Guilford Art Center is pleased to announce Vibrance, an exhibition of the ceramic work of Victoria Burnham, the Center’s Resident Potter since September, 2017. The exhibition is on view in the gallery August 22 – September 5, with an opening reception on Friday, August 24 from 6-8 pm, which is free and open to the public. Burnham is the third person to serve in the Resident Potter position, and this exhibition is the culmination of her work during her time at GAC. She has been responsible for working with pottery students, overseeing the facility’s studio practice times, and providing inspiration through her presence and her own creativity. The position is designed to provide the Resident with time and space to develop their own ceramic art while contributing to the workings of a communal pottery studio. 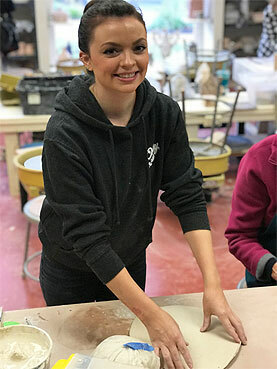 GAC’s ceramics studio offers classes for adults and children, Home School programs, weekend workshops, and summer classes for children. The studio is equipped with 12 wheels, a hand building table, 3 electric kilns, slab roller, extruder, outdoor downdraft gas kiln, raku kiln, and a glaze mixing room. Students may work with four different clay bodies, and a large selection of glazes. Opening reception for Victoria Burnham: Vibrance is Friday, August 24 from 6-8 pm. The reception and the exhibition are free and open to the public. Gallery hours are Monday-Friday 9am-5pm, Saturday, 10am-4pm and Sunday 12-4pm. The Guilford Art Center is a non-profit school, shop and gallery established to nurture and support excellence in the arts. Through classes for adults and children, gallery programs, a shop of contemporary crafts, and special events, the Center fulfills its mission to provide opportunities for the public to participate in the arts, to experience their cultural and historical diversity, and to appreciate the process and product of creative work. Founded in 1967 (as the Guilford Handcraft Center), the Center evolved from the first Handcraft Expo, held on the Guilford Green in 1957. It currently serves over 2,000 students in classes, presents juried and invitational exhibits of art in the Center’s gallery and operates a shop of find, handmade American crafts year-round. The Center also presents the Craft Expo, held on the Guilford Green each year in July, that features works by more than 180 of the country’s most distinguished artisans and is a much-anticipated annual event for the shoreline community.